1, Made from tough and durable PP. 2, Suitable for 8mm-455mm valve rod. 4, Color can be customized. 1, It is very convenient to use and simple to install. 2, Completely insulation, strong and durable. 3, It complies with the OSHA standards. 4, Multi-color for choices, that is advantageous for the division of labor management. 5, Custmization is also available(OEM / ODM). 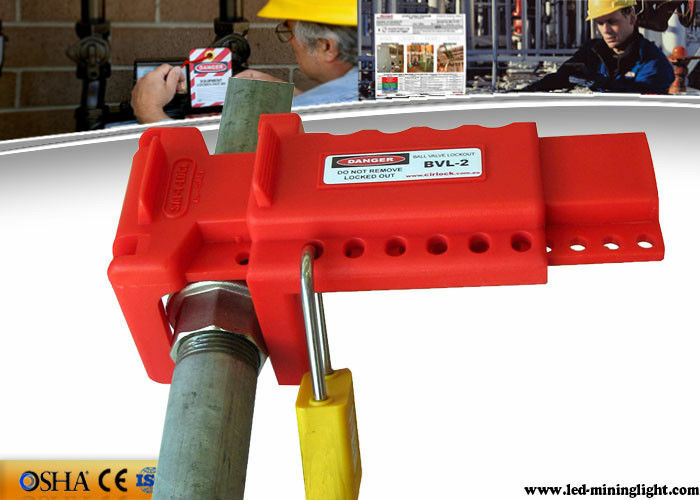 Our Safety Lockouts ad Padlocks are widely used in chemical, electrical, automobile industry etc. Valve Lockouts are a simple, low cost and effective way to prevent unauthorised operation of valves. It enables different types and sizes of valves to be locked out. No other device offers such fleibility and security. All sizes and colors are available. Custom valve lockout can be made upon request. Due to the hight rate of industrial accidents caused by unexpected organization, start up od machines or equipment, uncontrolled release of energy, reducing the industrial accidents becomes one of today's most serious issues. LOCKOUT/TAGOUT is a planned safety procedure that disables the energy supply of industrial machinery and equipment whilst servicing, maintenance work or repairs are in progress. Many of industrial accidents can be prevented by proper LOCKOUT/TAGOUT procedures. Making the right kind of LOCKOUT & TAGOUT equipment available to the employee is the responsibility of the plant's management. 1, products with low price and high quality. 5, Our products have coverred more than twenty countries in North America, South America, , Middle East, India, Europe, Africa etc. 1, If you couldn't find the exact product you want, never mind, just contact us and tell your requirements, we will arrange the moulds and manufacture for you. 3, Many products are available from stock with the next several days. 4, If required, goods can be collected from our factory directly to your customers. 5, We also support OEM manufacturing, with any given order quantity.